Looking for water front with a beach, full hookups, 50 amp. Beachfront without crossing a road is preferred but if the right place presents itself i'd consider something else. This would be a trip in June of 2019. Planning on spending sometime at Schlitterbahn water park and looking into that area. Joe, Carl should be the resident expert on Galveston Rv parks. That’s what I figured. He and Brett. Linda and I stay at Stella Mar, it's a mile from my house and easy in/out. Across the Hwy from beach and a nice biker bar! Get a pull thru in the middle and you will not hear anything at night, but your own breathing! It's about 2 miles from water park & Moody Gardens with the three pyramids (not to be missed)! Down town district is 10 minutes away! Sandpiper is on East end of Island, nice, not quiet in June! That sand gets mighty HOT. 15 min drive to downtown, 30+ to water park and Moody gardens! I'll give you more next month, I'll be on Island and go pick up a lot of stuff from Chamber of Tourism...maps, things to see, eat, stay, etc! No trip is complete without a Ferry ride when you depart (Free)! We took it 2 weeks ago...trill for Linda! dellanerarvpark.com, (409) 797-5102. Nice place on the beach side of the road. It is just east of Stella Mar. I looked at Sandpiper but it was behind a public beach and parking. Not a bad park but lots going on and it will be hi traffic and BUSEY with people going to the beach. Dellanera RV Park is more remot in there is no public parking right there for the beach. It is almost a private beach for the RV park residents. Look at Google Earth. Schlitterbahn water park should be fun. Whenever I hear Schlitterbahn water park I think of the one in New Braunfels Tx. It is on the Guadalupe River. Like carl said plan to ride the Ferry it is free and if you want you can leave your car and just ride it round trip. It is also a good way to see the dolphins in the bay for free. There are people who will take you out for a nice fee to see them if you want. We live 14 miles from Galveston. We have recommended both Sandpiper and Stella Mare as places to stay. Stella Mare is relatively new and is a very nice park. I think the sites have more room than Sandpiper but both are good. Dellanera is okay but rather tight between rigs. Further down is Galveston Island State Park. No sewer but dump stations are available. Past GI State Park is Galveston Island RV Park. It is much further out and closer to San Luis Pass. Beach access along the Blue Water Highway for cars/jeeps but the ride from Stella Mare or Sandpiper can be made in a TOAD easily. 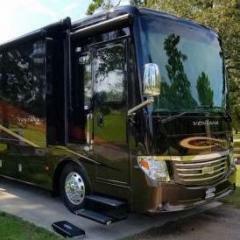 There are many more RV parks around the area so if you look up any on rvparkreviews.com and see one you might be interested in let me know and if I haven't checked them out yet I'll take a drive and look them over. JUNE??? That or before is when we leave her for the summer. Last two days it has been 90˚ here. Glad we are on the coast as there is usually a nice breeze. If we are in town please let us know when you will be here and we'll let you buy us a coffee, or come over to the house for a beverage or two. Do you like Glenfiddich? p.s., April is a much better time in Texas. Wayne, June, July, August, September, you do not want to be in any part of Texas! High 80's now, couple of weeks and you'll wish for 80's. WBill. Dellanera, was rebuilt after Hurricane IKE and it's a City Park. Tight? Yes, very! Currently there are 7 RV parks, including State Park, with over 2,000 spaces available! out of those 7, 3 are Resorts! That's what happens when you have 5 cruise ships a week. Over 14,000 hotel rooms. Wayne, I have only ever tried Glenlivet, I have a bottle at home aging. I have to wait until June for both kids to be out of school, same with the Hayes family that will be following behind with their coach and toad. Full hookups are a must or I have to start the coach and pull it to the dump station every morning and that gets old real fast! Next year ill let you know the specifc date, we can see if our paths could cross, that would be fun! This year is New Mexico crossing the panhandle of Texas, next year will be Texas. DW has been bugging for a long time to go and see the gulf coast of TX and Schlitterbahn. When I saw there was a few locations and one was on the coast line the opportunity made more sense to do it. I figured with the heat the water park seems like a good fit. The farthest south in Texas we have ever been is I-10 straight through. The original "Schlitterbahn" in New Braunfels is the ones the Kids will like the best. My daughter and son-in-law took their kids there for about 10 to 12 years. Hill Country Rv Park is a good park. Not fancy but you won't be in there too much. Herman, that was the only location I was aware of until yesterday. Thank you. Greetings all. After reading thru all the comments and looking thru the web sites of the various RV parks listed above, the Galveston area looks really appealing and thinking about as a winter local. Just wondering, what's the weather like February / March. Is it generally warm enough? You probbabley don't need your heavy parka. Looks pretty good, light jacket, hoodie weather. A big improvement on the snow and blow in the north! WBill. Dellanera, was rebuilt after Hurricane IKE and it's a City Park. Tight? Yes, very! Strange, I didn't have any problem and it fits Joes requirements, close to the beach full hookup, no roads to cross. A few folks from Six-State go to Freeport for the winter. Don't know which park but it is probably less expensive there then Galveston and it is just a short drive to Galveston. Look forward to the visit. As Carl stated, there are tons of RV parks around this area. Depending on your pocket book. Some for under $500 a month with FHU included. It all depends on what you are looking for. Most are between $450 to $750 a month and some include FHU and some require separate electric. Be glad to scout around when it gets close for you. Ian. We have a bunch of folks that come every year from Indiana & Minnesota, November to April, can't miss them....they are the one's in shorts at the Beach and Golf Course! This past winter was very unusual.....had one in early 1983, last. February is 50/50 fog, sun & 45 night, 65 days. March is when we plant. 55 to 75! If your on the Island, daily rates for FHU is $35 to $50 avg for year! Winter is high season. Suggest you book within the next month for next winter! Shorts at the Beach and Golf Course! Carl, sounds right to me! After all when your used to wintering in the land of ice and snow, 65 degrees plus feels downright tropical! Can't wait to escape next winter. Thanks for all the tips and info, have reached out to several parks and am in the process of booking. You know I actually thought it was too early to book, but you guys are right, parks are already filling up. I wouldn't have know this if I wasn't actively reviewing the forum! For a summer 2019 visit with your family, Jamaica Beach RV Resort is fantastic for kids of all ages (including parents as kids !!!) --> https://www.jbrv.net/ It is located on Galveston Island ~12 miles southwest of the City of Galveston on the "Blue Water Highway". Jamaica Beach RV Resort has lots of family amenities - pools, lazy river, splash pad, miniature golf, etc. Bathrooms & showers are clean and spacious. The beach is a very short drive across the highway from the RV resort. The summer rate for an RV spot is a reasonable cost. Weekend rates are quite high (but every lodging rate doubles or triples for summer weekends in Galveston !!). My grandkids ages 3 - 10 years old love Jamaica Beach RV Resort and the nearby beach itself and can spend their entire time at the RV resort or at the beach. An excursion to see the sites of the city of Galveston is a 15-20 minute away. If next summer will be your first time to visit Galveston take your family to Moody Gardens and the Pleasure Pier as they are quite good for the entire family. Reservations fill months ahead of the summer vacation season so don't hesitate reserving a site this coming winter.